Many companies are facing problems with Windows development using traditional Windows tools such as Visual Studio. When they write applications, even just "single platform" applications for Windows, they often have to account for differences between different Windows versions, which adds hassle to development and maintenance. Qt works no matter the Windows versions. This book provides all the information needed to become a professional Qt developer. The book also covers cross platform GUI programming - programmers can be working on Windows, Linux, or Mac and the book will work for them. This is useful for commercial companies that use Qt, and for companies that are evaluating Qt. It will also be valuable to the vast number of open source developers who already use Qt since no other book of comparable quality or comprehensiveness is available. This book teaches Qt's idioms and how to use Qt to best advantage. The book is organized into four parts. 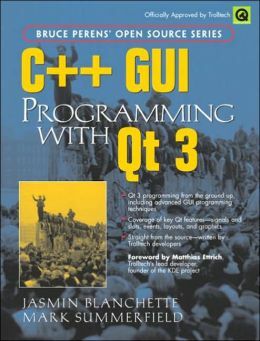 The first part introduces the C++ necessary for the effective use of Qt. The second part covers basic Qt, starting with some very short examples, and quickly building up to a complete Graphical User Interface program. The second part provides coverage of key Qt features including signals. The third and fourth parts cover more advanced and specialized material.